Are you still looking for “the perfect gift” for someone on your holiday shopping list? Perhaps you are shopping for someone that is hard to buy for and you don’t have a clue where to even start. I have a unique gift idea to share today and one that will surely stand out above the rest. UNICEF Survival Gifts are a collection of 54 gifts that are essential for child survival and development. The items in this collection help children around the world living in areas affected by poverty, conflict or natural disaster. These are kids not concerned with getting the latest tech toy under the tree. They are struggling just to survive. As of mom, my heart goes out to these kids. Hearing about their plights reminds me how blessed we are living in Canada with a roof over our head, access to medical care, clean water and food on the table. I think UNICEF Survival Gifts are a fantastic way to give back and also offer teachable moments to my own kids to ignite a conversation about children in need in other areas of the world. UNICEF Survival Gifts are different from making a straight monetary donation in the recipient’s name. I like that it is tangible – you can see exactly what your money is buying and how it will help. I also appreciate that it shows you how many children the Survival Gift will benefit. Giving back to others feels wonderful and is a meaningful. It’s life-changing as well as life-saving. That type of gift will be one that will stand out in memories for a long time. UNICEF Survival Gifts are real items and shipped from UNICEF’s warehouse in Copenhagen to children and families around the globe. They include vaccines, food, medical equipment, water purification and much more. The Survival Gifts range in price from as inexpensive as $10 and up. You can buy some big ticket items if your budget is larger. For instance, this Motorbike is $2,683 and will benefit 3,600 children! 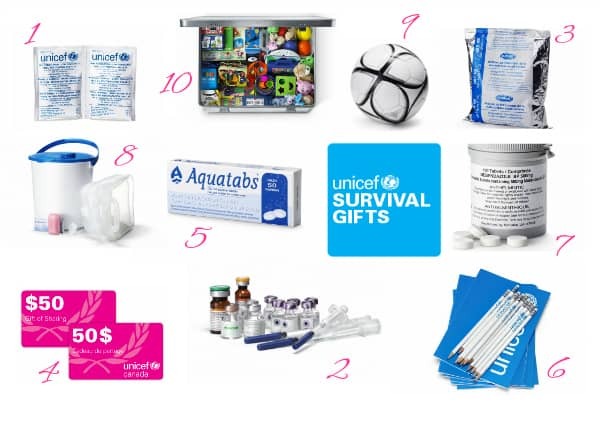 I’ve come with a list of my top 10 UNICEF Survival Gifts perfect for gift-giving. They are inexpensive and many would be great “stocking stuffers”. 1. Rehydration Therapy ($27) Reaches 8 children: Includes 253 packets of oral rehydration salts to provide treatment to children suffering from dehydration. 2. Vaccine Pack ($44) Reaches 84 children: Includes a pack of three essential vaccines – 72 tetanus, polio and measles vaccines to guard children against deadly diseases. 3. Therapeutic Milk ($20) Reaches 12 children: Includes 25 powdered milk sachets that provides 50 glasses of milk for children. Milk is a necessity at emergency feeding centres, refugee camps and hospitals. This milk has added vegetable fats, carbohydrates, vitamins and minerals to provide lifesaving nutrients to malnourished children. 4. $50 Gift Card ($50) Reaches 100 children: Let the recipient choose their own gift that is close to their heart. It comes with information about the four high-need areas for kids – water, health, play and education – and a unique code for redemption. 5. Water Purification Tablets ($10) Reaches 20 children: Includes 1428 water purification tablets to provide a family of four with enough clean water for two months. We can’t live without water and it can mean the difference between life and death. 6. School Essentials Bundle ($18) Reaches 30 children: Includes 60 pencils and 30 exercise books to help give kids a chance to learn at school. 7. Anti-infection Tablets ($18) Reaches 135 children: Includes 540 anti-infection tablets to help protect children against worms and potentially deadly intestinal infections. 8. Clean Water Kits ($38) Reaches 10 children: Includes two clean water kits to supply two families with everything they require for safe and hygienic water collection. 9. Soccer Balls ($14) Reaches 2 children: Includes two soccer balls to give the gift of sport and fun. 10. Learn and Play ($57) Reaches 13 children: Includes one soccer ball, four storybooks and four school supply sets to give kids the gift of fun and imagination. When you place your order, you’ll receive a description of the gift on your choice of printed card with envelope, a printable PDF card or a the option to send a personalized e-card with your order. This Christmas, give the ultimate gift with a UNICEF Survival Gift. Visit UNICEF Canada to learn more and to finish up your holiday shopping! Which UNICEF Survival Gift would you most like to give to someone special in your life? Connect with UNICEF Canada on Facebook, Twitter, YouTube, Pinterest and Google+. We’ve always supported UNICEF. These are great products! Now those are some real Christmas gifts! Thank you for sharing! I would gift the gift of a vaccine pack! That’s an essential need for sure! I love the idea and cause! Wow, this is really inspiring! Things that some of us take for granted all the time! Thanks for sharing this, definitely Christmas gifts that make a difference! UNICEF is a great group to support. Thanks for the suggestions. This is so wonderful! Every year as a family we pick a gift to “give to Jesus” where we give to someone in need. These are perfect for this year’s gifts. Thanks so much for sharing! WE support UNICEF every year and this is very inspiring to hear how they can get help with things that are so important to them. Wow! It really makes you stop, think, and be thankful for all that you have. We are very blessed.